The presentation is to review the two policy programs for women in science and technology fields by the Ministry of education, culture, sports, science and technology (MEXT), and to discuss about the positive action projects by some institutions. The first program is “Supporting activities for female researchers” which started on FY 2006 as one of special coordination fund for promoting science and technology. It has promoted the support projects for female researchers by 55 universities and research institutions, however was decided to finish on the end of FY2013 with the completion of the special coordination fund. As the projects, the institutions carried out setting the nurseries and counseling rooms, opening the office for the supporting female researchers and holding the symposium for enlightening the faculty members for three years. This program exactly provided the better circumstances for the researchers on the campus. However the ratio of female researchers in these institutions did not increase at all. The University of Tokyo’s objective that the ratio of female researchers in new adoptions has reached 25% was not achieved by finishing the program. One of the biggest reasons could be the decrease of faculty positions since incorporation of national universities on 2004. Many institutions have been insisted on keeping the activities of education and research by the fixed-term professors and researchers who are employed using the project fund. The ratio of women in the fixed-term employees could be higher than in the regular ones. The second program is “Supporting positive activities for female researchers” which was accepted the five years plans to adopt many female professors into faculties by 12 universities on FY2009 and 2010. The universities spend the fund for start-up research expenses of new adopted women and part of their salaries. Some Universities prepare faculty positions for women under the president’s decision, and other ones spare the departments which adopted female faculty members the extra fixed-term positions (one + one action). Under the program, over 300 female researchers will get new positions in those universities by FY2015. Exactly, some female researchers told that they applied such positions because the recruitments were specified to women and could believe the possibility to adopt. In Japan, many researchers consider that the selection would not be fair in the faculties. That might be one of the biggest problems to encourage women in academia. On the other hand, there could be such opinions that this program would aggravate the recruitment system in the scientific fields. As mentioned above, total academic stable research positions in Japan are gradually decreased, and younger excellences are losing the interests in success in the academia. 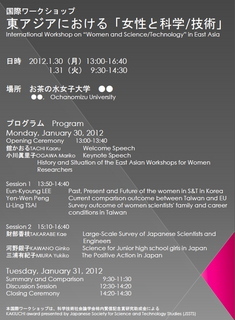 My presentation is on girls’ attitude towards science using the questioner data collected from Junior-High School students. “202030” is the goal set for gender equity by the Japanese government in 2003, the ratio of women leaders will be increased to 30% in all fields by the year of 2020. Scientist is defined as one of them. My presentation is about junior-high school girls in 1999 and 2000. This generation of students is now taking doctoral courses in 2011. The women student ratio in 2011is the following; science 17%, engineering 16%, agriculture 34%, health 33%.The average ratio of natural science has not reached the 30% goal. It is clear that increasing the number of girls who major in science related areas is vitally important to promote the women scientist ratio. 1, Girls have a more negative attitude toward science than boys. 2. Girls negative attitude in Junior –High School is getting worse than in their elementary schools. Based on these findings, the reason why few girls major in science courses is their negative attitude toward science. This conclusion is right and seems to be forming the general view about ‘science and girls’. But the collaboration research which I was involved with (MURAMATSU ed.2004) is focused on three other points. Firstly, the research data shows that girls dislike science more than boys in the 7th grade, they study all 9 subjects in Junior high. At the same time, this data also shows that girls do not completely dislike science. It means that the general view has some limitations. Secondly, the girls’ ratio of ‘dislike’ science are increasing more than boys from 7th to 8th grade. But it has also other side. If we focus on the girls’ ratio of change from disinterest to interest after entering the junior-high, it is 28.4%, almost the same as boys’. Lastly, what students’ recognize as the value of learning science in the 7th and 8th grade are two important points. 1. Girls recognize that the value of learning science is inside science as well as boys. 2. There are two statistically significant items related to their career, firstly education and secondly to find employment. These results show that the value of learning science for boys seems to be in benefiting their future academic achievement and career. That is boys tend to have an advantage in science. On the contrary, girls’ change to a positive attitude towards science is related to future family life. If our understanding is restricted to only the general view, we wouldn’t be able to find that girls’ attitudes towards science are variable and the general view makes the myth about ‘science and girls’ that girls have negative attitude towards science. Moreover this myth prevents building girls’ high self-confidence and raising peoples’ expectation for girls. It is one piece of the evidence that girls felt less expectation from their parents and teachers than boys. This lower expectation seems to originate from the general view, and these low expectations will help to reinforce girls more negative attitudes towards science. It creates a vicious circle. In conclusion, it is dangerous to believe in the myth about ‘science and girls’ from the general view. What is important is to firstly look at the positive side, secondly raise expectations and give more encouragement to girls to enhance the ratio of women scientists. In my presentation, I would like to introduce Large-Scale Survey of Japanese Scientists and Engineers to the researchers among the East Asian countries, share its methodology, and finally explore the possibilities for the East Asia countries to construct this kind of extensive survey in order to enable international comparison in the near future. The focus will be on the methodology of the survey, not on its results. The science and technology basic Plan for the second term, which was approved by the cabinet in March 2001, emphasized effective usage of human resources and developments of diverse career paths. One of its focuses was to improve the working environment for female professionals in the science and engineering fields. To address this issue, Japan Inter-Society Liaison Association Committee for Promoting Equal Participation of Men and Women in Science and Engineering (EPMEWSE) was established in October 2002, in order to promote a gender-equal environment and networking in the science and engineering fields, and to contribute to society as a whole. In 2003, commissioned by MEXT as a research project under the Lifelong Learning Policy Office, a survey was conducted as part of EPMEWSE’s activities. The purpose of the survey was to understand accurately the current situation, and to make recommendations regarding practical solutions and effective enlightening activities. Most of the previous surveys focused on female professionals, with the goal of raising their status to the same standard as males’. In contrast, this survey was conducted with cooperation of 39 academic organizations that belong to EPMEWSE, and a uniform set of questions was asked of every member in a science or engineering profession. Data were collected not only from science and engineering professionals at universities and former national research institutions, but also from corporations, in order to provide broader-based findings for making recommendations. In 2007, the second survey took over the first survey. It mainly targeted members of more than 60 associations joining of EPMEWSE, and it also invited subjects from various related fields, other than the members. In 2012, the third survey is scheduled. East Asian countries separately began to collect data on women scientists and engineers. In order that each country should make use of the data of other countries, we are urged to share both data and their methodology. From this point of view, the methodology of Large-Scale Survey of Japanese Scientists and Engineers could be discussed as a possible statistical foundation among East Asian countries for the future. This research aims to investigate the family and career conditions of women scientists in the academia in Taiwan. A questionnaire survey was conducted during May 27 to August 31 in 2008 over internet. It contains 47 questions in four categories, including professional progress, marriage and family, career satisfaction, career self-assessment, and was distributed to 1655 female researchers applying for the National Science Grants in science, bio-medical, and engineering fields. Only 396 responses were received and 389 of them were effective. For professional progress, more than 90% of the 389 respondents hold PhD degrees and acquire their first full-time jobs at the average of 33.7, which may cause them the conflicts between biology clock and tenure clock. For marriage and family conditions, 80% are married, among whom 50% have more than two children, while 25% have one child and 25% none. The respondents averagely spend 25 hours in caring and 12 hours in household work per week, which adds up totally to 1.31 hours more than the average of all working women. While more than 80% of them receive sufficient family support, almost 40% still feel distracted by caring and household needs during their work shift. For career satisfaction, the satisfaction rates of all questions reach to about 40%-50%. However, when the satisfaction is based on comparison against their male colleagues, the satisfaction rates change. The respondents seem to stress more on the satisfaction when compared with male colleagues. As for whether their institutes should recruit more females, surprisingly only less than 30% agree and more than 50% feel their situations are OK. This outcome challenges the common thoughts that women scientists need more female colleagues and the institutes have to increase their percentages of female researchers. Also, after Chi-square test, the career satisfaction rates differentiate significantly among different ranks of full, associate, and assistant professors. The full professors report the most satisfaction on their rank (90.2%), their allocated space (70.7%), laboratory support (59.5%), grants received (58.8%), professional invitations (61.4%), and honor granted (59.6%), which are far more than those of associate and assistant professors with only 30-40%. And the associate rank reports the least time of leisure 10.6 hours per week. For career self-assessment, shortage of work time is the difficulty most (70%) respondents feel, as professional loneliness the second (40%), and in need of child care the third (30%). Teaching and supervising students compose their most workloads. In sum, this survey shows the family and career conditions of women scientists in Taiwan. As it is an initial effort and has already disclose many interesting findings, further research is needed to explain further inquires, including international comparisons.